Newmarket Art Studios runs art courses and painting courses. Courses are taught by artist Donal Murray who now lives in Dublin, Ireland after studying abroad in the US. Donal’s paintings include a wide variety of subjects from cityscapes, landscapes, portraits, equestrian scenes and mural painting. He has worked on several large scale mural paintings for both the corporate sector and the church. 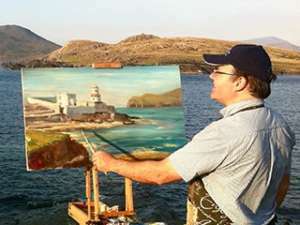 Donal is currently working on a series of paintings based on the windswept beauty of Ireland’s lighthouses. Donal Murray teaches the Art Course and Painting The Portrait course at Newmarket Art Studios and offers professional art and painting classes and lessons in Academic portrait painting. The seven-week Painting The Portrait art course focuses on producing portraits that have great likeness with expressive painterly qualities. The course workshops will take you through a series of techniques that will help improve your observation and painting ability, creating portraits that look convincing and lifelike. All students on our art and painting coursse must provide their own art materials, however, easels and boards are provided. The Art Course and Painting The Portrait course are suitable for improvers and beginners. For more information about art and painting classes at Newmarket Art Studios, view our courses below in Nightcourses.com’s Course Finder.